Funding for transportation investment continues to be a popular item at the ballot box. There are currently 76 highway, bridge and transportation revenue related initiatives up for vote in 2014. This includes seven statewide proposals. 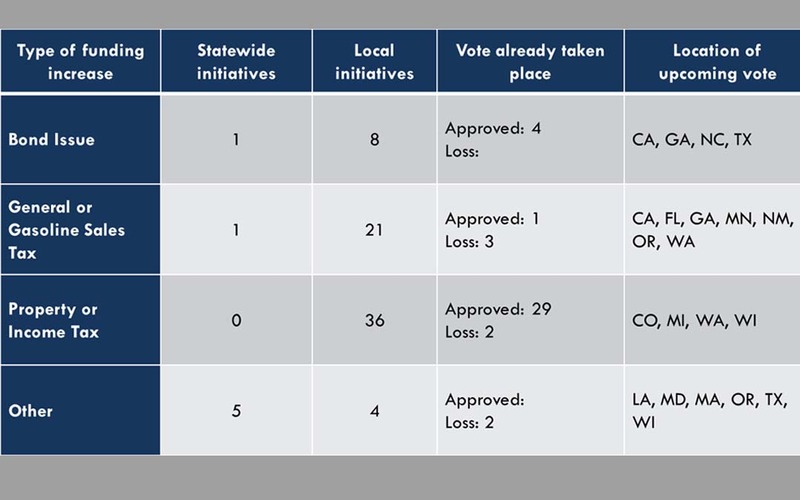 Of the 76 initiatives, 41 have already been decided and 35 are pending upcoming elections, with the potential for additional measures to be added as ballots are finalized. We will have a full analysis of the funding measures after the November 4 election. Historically, local voters have approved 73 percent of the 425 initiatives to increase county and local funding for transportation investment since 2000. These include bond measures and the renewal, extension, or implementation of a sales tax, property tax, or income tax. View previous analysis. You can also find some recent analysis on ballot initiaves and trends in ARTBA’s Transportation Builder Magazine.